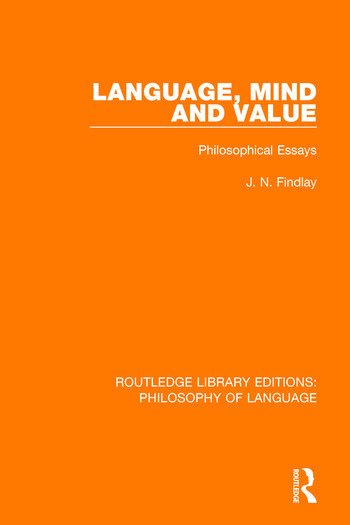 Philosophical themes as diverse as language, value, mind and God are among the topics discussed in this book, originally published in 1963. Considerably influential, there are contributions on Time, Camrbidge Philosophy, Doedelian Sentences, Morality by Convention and the Non-Existence of God. They reflect a gradual move from a position where the influence of Wittgenstein is paramount, to a position where there is considerable criticism of linguistic philosophy and a growing interest in the approaches of Hegel and the phenomenologists. 1. Some Reactions to Recent Cambridge Philosophy (1940-1) 2. Time: A Treatment of Puzzles (1941) 3. Goedelian Sentences: A Non-Numerical Approach (1942) 4. Morality by Convention (1944) 5. Can God’s Existence Be Disproved? (1948) 6. Values in Speaking (1950) 7. Linguistic Approach to Psycho-Physics (1950) 8. The Notion of Infinity (1953) 9. The Justification of Attitudes (1954) 10. The Logic of ‘Bewusstseinslagen’ (1955) 111. Review of Wittgenstein’s Philosophical Investigations (1955) 12. Some Reflections on Meaning (1959) 13. The Contemporary Relevance of Hegel (1959) 14. Some Neglected Issues in the Philosophy of G. E. Moore (1960) 15. The Methodology of Normative Ethics (1961) Index.